EricCook.com: Facebook Moves "Schedule Later" Feature - Did You Notice The Change? 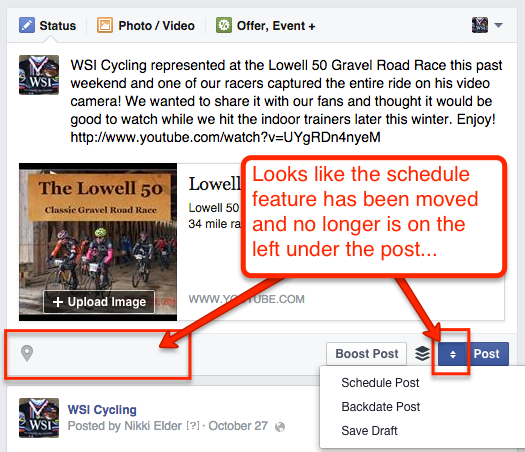 Facebook Moves "Schedule Later" Feature - Did You Notice The Change? One of the Facebook features that I use quite a bit for clients is the "Schedule" feature that gives you the ability to pick a date and time in the future for your post to appear. This is nice because not every time are you on Facebook do you want to publish your post (especially if you're like me and keep some strange hours). While performing some updates for our cycling team, I noticed the little "clock" icon that use to sit in the lower left corner of the page was gone. What! No more scheduling posts... After I calmed down, I noticed some new up/down arrows next to the Post button. Sure enough, Facebook moved that feature and moved it closer to the post feature. As you can see from the above image screenshot, now when you click on the arrows you get Schedule Post (yae) as well as Backdate and Save Draft. This is also a nice feature for admins since you may not be ready to post to your page, but don't want to have to start over. I used to do this by posting well into the future and then going into my Activity Log to edit it, but now the Save Draft does it the right way. What other new changes have you found in Facebook recently? Picked up on the ability to change the identity (voice) when commenting "as you" on a page you manage? Would love to hear what you've found (and what you think) in the comments below.